Welcome to our mobile site! 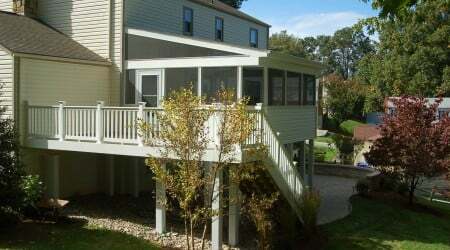 This screened porch was built in the Derwood, Maryland area of Montgomery County. It features a simple lean to roof style, which is the least complex and least expensive way to build a roof. The AZEK Brownstone decking line was used in conjunction with white vinyl handrails for an interesting two-tone look. A SCREENEZE screening system was installed in the open pseudo window bays with a fiberglass mesh screen. White PVC trim covers all of the exposed pressure-treated wood, which can be seen underneath the deck. 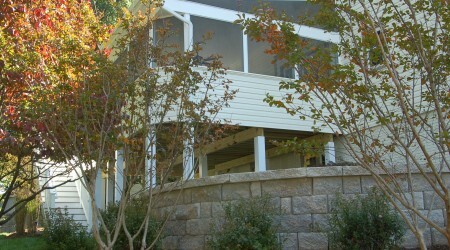 A vinyl siding knee wall was built around the perimeter of the screen porch.